We welcome all forms of feedback from customers and residents, whether positive or negative. We will treat all feedback seriously, review it, and use it to promote continuous improvement in our services. 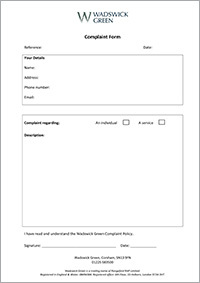 This complaints procedure is designed to deal with complaints effectively, delivering a speedy, responsive, accessible and user-friendly service. We will not treat you any differently if you make a complaint. We will cooperate in the same way with an intermediary acting on your behalf. Please discuss your concerns informally with the relevant member of staff or supervisor at the earliest possible opportunity. If your complaint is regarding Rangeford Care, please write to the Rangeford Care Manager at The Pavilion, Wadswick Green, Corsham SN13 9FN or feedback.care@RangefordCare.co.uk. 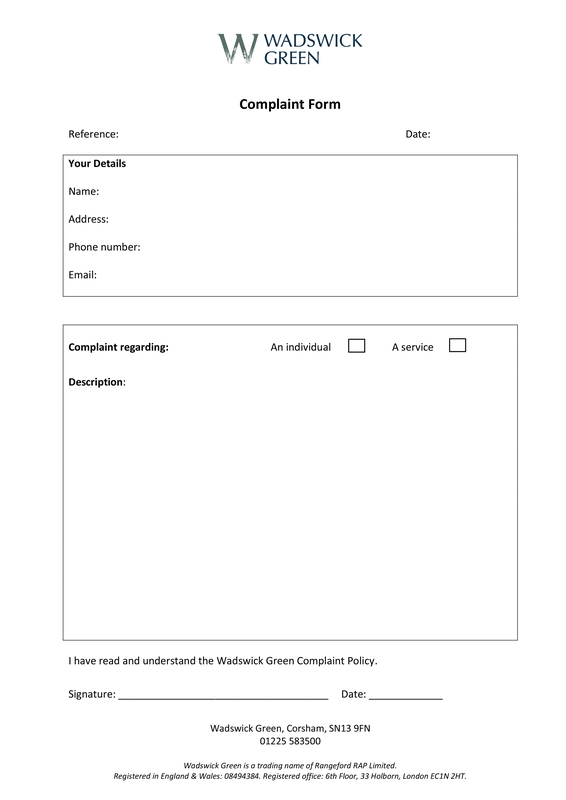 You can also fill in and submit a Complaint Form, which is available at reception or can be downloaded at the bottom of this webpage. The Care Manager will acknowledge your complaint within 24 hours and investigate the matter. If appropriate, and if you agree, the Care Manager may arrange a meeting for you with relevant staff to discuss the matter before responding to you. In any case the Care Manager will respond to you within 10 working days. If you remain dissatisfied with our informal response (step 1) or, if relevant, the formal response from the Rangeford Care Manager (step 2), please write to the General Manager at The Pavilion, Wadswick Green, Corsham SN13 9FN or feedback.wg@WadswickGreen.co.uk. The General Manager will acknowledge your complaint within 24 hours and investigate the matter. If appropriate, and if you agree, the General Manager may arrange a meeting for you with relevant staff to discuss the matter before responding to you. In any case the General Manager will respond to you within 10 working days. If you remain dissatisfied with the General Manager’s response please inform us and we will escalate your complaint to the Chief Executive of Rangeford Holdings Ltd. The Chief Executive will provide our final decision within a further 10 working days. If at any step we require more time to investigate the matter or respond, we will agree a new response deadline with you. We will always provide a final decision in writing within 56 calendar days of receiving a complaint, not including any time that you may take in deciding whether to seek escalation, unless we have previously agreed a later deadline with you. If at any step you tell us that you are not satisfied with our response, we will not require you to write in again in order to pursue the complaint through the escalation procedure. If you remain dissatisfied with our final decision or we fail to provide that decision by the relevant deadline, you may refer your complaint to the relevant Ombudsman Service. We will co-operate fully with the Ombudsman Service during any investigation and comply fully with the resulting final decision, which will be binding on us. Click below image to open our complaint form on a new browser window. You can then print out the form from your printer.